On Oct. 6, the Paris Agreement passed its last major hurdle, meeting the 55/55 threshold to come into force. As of this writing, 76 of the 195 nations that signed the Paris Agreement at COP21 in December have ratified the treaty within their own national governments. So far, ratifying nations represent 60 percent of global greenhouse gas emissions. For anyone who has followed this process over the past 20 years, and for those of us who came home from COP15 disheartened and dubious of the UNFCCC process, this is a "giant leap for mankind." Or, as former UNFCCC Chief Yvo de Boer says, it's "a small step for mankind, a giant leap for man." The door was opened in Paris, and last week we stepped through the threshold, once again affirming the Art of the Possible. How did this happen? And what happens now? From the very first day when world leaders gathered at Le Bourget, to the hard-fought final deliberations stretching into the wee hours of Dec. 12, nations of the world were determined to put the past behind them and forge a new path. Just two weeks after the brutal terrorist attacks in Paris, COP21 proved there is common ground on which humanity can act. All nations, all people and all sectors of society share the same earth beneath our feet, air that we breathe, and water that we drink. Paris was a high-water mark in a process fraught with division and distrust. The Paris agreement is far from perfect, but it signaled an opening. We had given ourselves an opportunity that was long overdue. After the back-slapping and jubilation, reality inevitably set in. Getting 195 nations to sign a document was hard enough. Turning the words on a page into real action was something else entirely. Bringing the Paris Agreement into force required 55 signatories of the treaty, representing 55 percent of global GHG emissions, to “deposit instruments of ratification” from their home countries. The ratification process might take years. 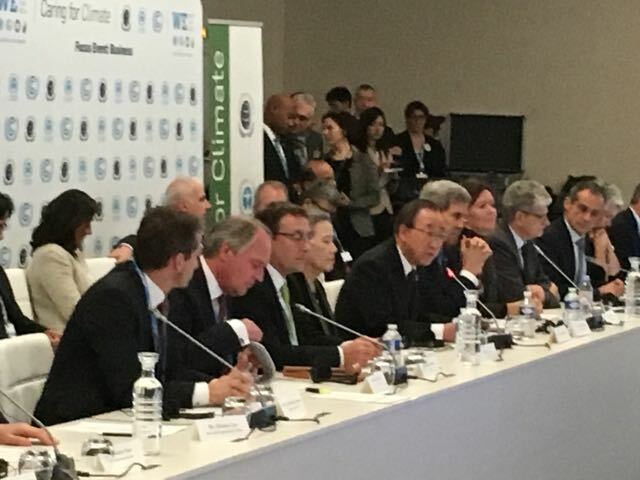 Could the world maintain the momentum of Paris? Initial signs were positive. On April 22, 175 parties to the agreement participated in a signing ceremony at U.N. Headquarters. Fifteen deposited their instruments of ratification. Other countries soon followed. But questions remained about how soon the 55/55 threshold could be met. The world churned on. Tragic conflict raged in the Middle East, as it does to this day. Terrorism and civil unrest continued, seemingly unabated. A turn toward tribalism in national politics brought Brexit and the spectre of a possible Donald Trump presidency. Would the world become distracted, consumed once again by our fears and suspicions, unable to move? The threshold is now met, and the Paris Agreement comes into full force on Nov. 4. “This week is going to be historic,” Paula Caballero, the director of WRI's Climate Program, said at the press conference. To be sure, there remains a long, hard row to hoe to secure a livable planet in the years, decades and centuries to come. Climate change is not some distant phantom; it is here and now. And it will get worse before it gets better, no matter what we do. There is no magic wand to cure the challenges of global warming and sustainable development. As it stands now, the intended contributions from all signatory nations don’t add up if we hope to limit warming to 1.5 degrees Celsius, let alone 2 degrees. But we go into the coming years with our eyes wide open and the framework in place to increase our ambitions. So, now it is on to COP22 in Marrakesh and CMA1, the first meeting under the Paris Agreement. Ratification is no instant panacea. But instead of the beginning of the end, we now arrive at the end of the beginning. Let’s get to work.